The purpose of this timeline is to record the series of events of the orthodox synagogue from its establishment through to the time the building was demolished. Feel free to download this text for research or writing purposes. Leadville’s Orthodox congregation Knesseth Israel formed as a result of differences in worship philosophy and practice with the existing Leadville congregation. The reform congregation based at Temple Israel revolved around distinct American Jewish reform principles. The orthodox disagreed with these fundamentals. Accounts point to these three points of disagreement which fostered the separation: the use of choral and pipe organ music during services; gender integrated prayer; and methods of commemoration of the dead. The first mention of separate services appears in a Leadville Daily/Evening Chronicle article from October 9, 1886. That year Yom Kippur services took place at both Temple Israel under the reform congregation and “City Hall” under the Orthodox congregation. 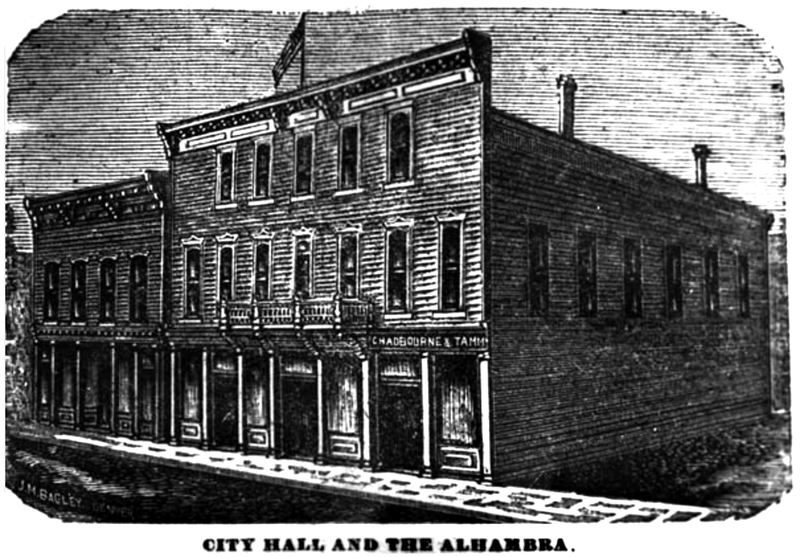 City Hall was a communal building that hosted many public events in early Leadville and was located on the 100 Block of East 6th Street. It burned to the ground in 1916. The old Armory Hall or Turnverein across Pine street from Temple Israel also held Orthodox services in the late 1880s and early 1890s. By 1892 the congregation had purchased and moved into the old Presbyterian Church on West Fifth street. 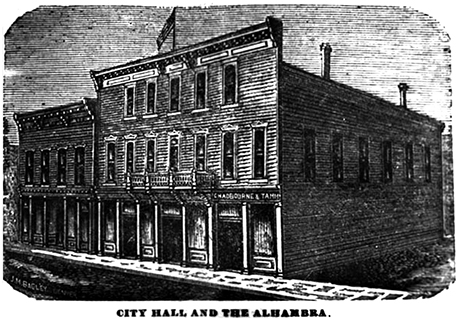 City Hall at 132-134 East 6th Street around 1880. Lithograph Courtesy Lake County Public Library Mountain History Collection. Details of the separation of the Orthodox from the reform congregation is varied. 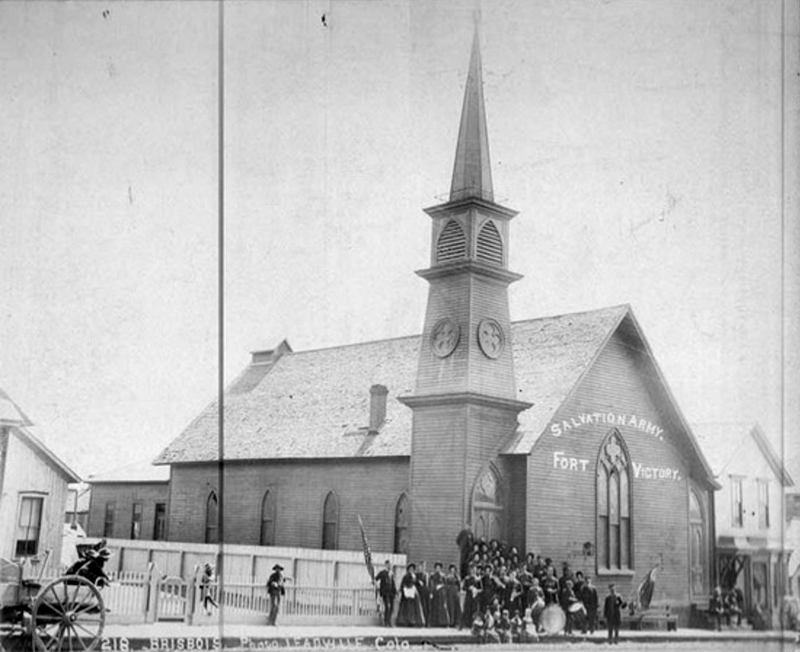 In the History of Leadville and Lake County, the story of Knesseth was remembered with the following, “…A footnote to the story [Ben Davies scandal]  was told by Raabe children who claimed that after they and their mother returned from Europe in 1893, their parents decided to start attending services again at Temple Israel. The first time they went, not one member in attendance would speak to them, even though some of the congregation patronized the family business. Moreover, three years earlier dissension had arisen with the Temple Israel congregation as to how the worship services should be planned and conducted. Since a satisfactory compromise could not be reached, the orthodox members organized the Kneseth Israel congregation during the summer of 1892 and met in homes of various members for the next few years. According to Alan Breck of The Centennial History of the Jews of Colorado the Orthodox congregation split away from the Reform due to disagreements about “…the lack of proper ritual, particularly in the commemoration of the dead… on August 28, 1892, they formed Kneseth Israel”. By late summer of 1892, the organization was in its beginnings. The first officers of the congregation were D. L. Rachofsky, Louis Greenwald, Jacob Bergman  , J. Hurwitz  , Joseph Tobolowsky  , and Zundel Greenwald  . Membership probably did not exceed 30 at Knesseth. The building that would house their new devotions was still occupied by the Salvation Army for most of 1892. It had been originally built in 1880 as the first Presbyterian church in Lake County. 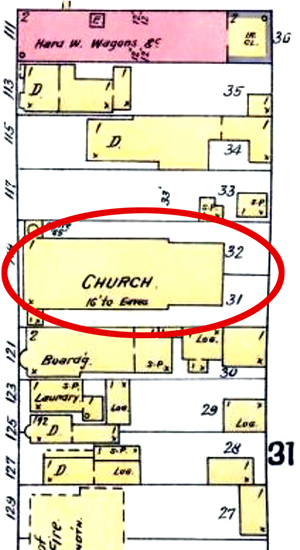 By November, the congregation was interested in a permeant headquarters and bought the old Presbyterian Church at the beginning of the month (see endnote 8). The following is a chronological list of appearances of the Knesseth Israel building and congregation in newspapers from 1892 through 1923. Knesseth Israel building in 1892. Courtesy Library of Congress Sanborn Fire Insurance map 1895. The Presbyterian church building around 1892 shortly before it was acquired by the Knesseth Israel Congregation. Courtesy Lake County Public Library Mountain History Collection. Knesseth Israel does not appear in newspapers and the city directory does not exist for 1896. April 1- “Sunday April 1, at the Orthodox Jewish Church, 119 West Fifth street Miss Minne Olena to Mr. Aron Walpusky, Judge H. P. Krell and Acting Rabbi Adolph Schayer Officiating. The groom was attended by Mr. and Mrs. Mankus and the bride by Mr. and Mrs. S. Flaxx. March 22- “The Purim services will be held at our [Knesseth] synagogue Saturday March 22, at 8 pm and Sunday March 23 at 8 am. All invited. October 2- “Six o’clock last night was the opening for Jews the world over of “Rosh Hashonah… with its coming many Jewish people of Leadville wended their way to the Orthodox Jewish church at No. 119 West Fifth street, there observing their annual ceremonies, which were presided over by N. H. Miller one of the most prominent members of that church in the city. September 20- “There is one recent memeber of the Jewish colony of Leadville to whom the Jewish holidays this year will have a special significance. Sam Weiss a druggist engaged here until ill health recently forced his retirement, is now comfortably situated in the sanitarium of the Jewish Consumptive Relief association at Edgewater Colo, through the generosity of members of the local Temple of Israel, and that the needed assistance brought his gratitude was touchingly expressed yesterday in a letter to S. J. After, of the Boston Bazaar, who took a leading part in gaining his entrance to the home. The sanitarium of the association has been crowded of late, owing to its good work in the past and its growing reputation. It was not without considerable correspondance that Mr. Amter secured a place for Mr. Weiss, whom other members of the Temple here with Mr. Amter wanted to assist. Secretary Spivak was finally able to notify the local men of the vacancy in the home, however, with the result that they immediately provided means for Mr. Weiss’ entrance. They secured a berth for Mr. Weiss on a Wednesday evening train and he departed the same evening for Edgewater. His letter yesterday was expressive of his gratitude to the local Jews and his commendation of the management of the sanitarium. September 27- “Leadville Jews, observing the holiday with services in the synagogue at 125 [actual 119] West Fifth street gave Yom Kippur, the day of Atonement unusual significance yesterday by starting a campaign to raise for for the $10,000,000 war fund which Jews throughout the country are now raising to aid Jewish suffers from the war. S. J. After gave a patriotic and appealing speech to the congregation in support of the fund and gave a decided impetus to the local campaigns. As a result of the bringing forward the subject, Miss Ethel Sandusky and Mrs. Henry Issacs were anointed as a committee to handle the local funds and the activities of the campaign. August 25- “Fourteen youths who are become 21 since June 5 last registered under the army draft law at the courthouse yesterday when the army board sat as a board of registration for the purpose. September 8- “The Jewish congregation will observe services at 8 o’clock this morning and from 10 to 11 am they will have a war prayer and war lecture at the temple at 125 [actual 119] West Fifth street. All Jewish patriots are expected to attend these special ceremonies. Adolph Unger of Salida and H. Miller of Leadville presided at the services yesterday morning and will probably officiate again today. The Rosh Hoshana festival ushers in Yom Kippur this evening. The later festival will continue until Monday evening. September 9- “‘Leshono Tabo Tecosavoo’ read a messages sent yesterday by Kenneth Israel congregation of Leadville to five members who are serving in the American army and navy and the expression means “Happy New Year”. It was dispatched to Sergeant Maurice Miller, Louis Naginsky  , Isadore Mankus  , Meyer Stager and Jake Sandusky, all of them Leadville boys who are now on duty in camps in this country, both east and west, with the exemption of Mankuss who is a sailor aboard ship in the Atlantic. Mankuss volunteered for the navy early this year. The other four were called for the national army early this summer. The message signed by S. J. After chairman of the special committee said: ‘By a rising vote at our services, congregation Kneseth Israel conveys to you hearty New Year Greetings. We are proud that you are fighting for America, our county, and our prayers are offered that you may do your duty nobly and return home safely. March 12- “Mrs. L. Greenwald of West Fourth street has been named chairman in charge of arrangements for the expected visit of Mr. William Friedman and Harry Frankle, of Denver in connection with the campaign to organize local branches of the Union of American Hebrew Congregations according to information reaching here yesterday from the organization headquarters in Cincinnati, O. Mr. Frankle is president of the Emanuel Congregation of Denver. While here, Dr. Friedman and Mr. Frankle are expected to confer with the Jewish leaders. September 7- “…services [Rosh Hashanah] will be held in the evening of Monday from 7 to and Tuesday from 8 to 12 in the morning at the Orthodox Jewish church on West Fifth street. Practically all Jewish business houses will be closed on Tuesday. Ballenger, JH and Richards. “Ballenger & Richard’s Twenty-Seventh Annual City Directory: Containing a Complete List of the Inhabitants, Institutions, Incorporated Companies, Manufacturing Establishments, Business, Business Firms etc. in The City of Leadville for 1908, 1910”. Corbet and Ballenger and Richards Publishers. Leadville, CO; USA. 1908, 1910. Breck, Allen duPont. The Centennial History of the Jews of Colorado 1859-1959. Denver, CO: The Hirschfeld Press, University of Denver Department of History Series, 1960. Griswold, Don L. Griswold and Jean Harvey. History of Leadville and Lake County, Colorado, Vol. I and II. Boulder, CO: Colorado Historical Society in cooperation with the University Press of Colorado, 1996. Sanborn Fire Insurance Map from Leadville, Lake County, Colorado. Sanborn Map Company, 1895. Map. https://www.loc.gov/item/sanborn01031_001/.